In our armchair travels we have arrived in Greece. Everyone knows the beauty of the Greek Islands. 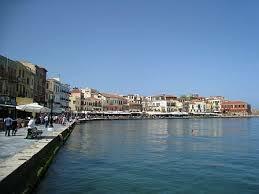 Our first stop takes us to Crete which is the largest Greek island and the fifth largest in the Mediterranean Sea. The region of Chania or Hania on the western side of Crete is overshadowed by the incredible White Mountains and is popular for its National Park. 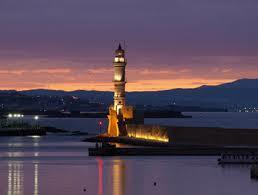 The charming city of Chania will make you feel as if you have stepped back in time. It is a city where there is beauty all around and you just want to wander through its streets. It is also a paradise for food and wine lovers. Here you can taste excellent Cretan wine and take tours of wineries. 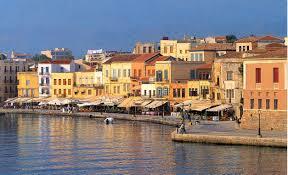 The very heart of Chania is its Old Town. Here you can wander along narrow alleyways like in a labyrinth and see many impressive building from different periods in time. It is the perfect place for romantic strolls. The Old Town stretches along the Venetian Harbor from Firkas Fortress and the Maritime Museum to the Gate of Sand and on to the east of the arsenals. This particular part of town within Venetian walls also includes Byzantine Chania. Rising above the Turkish mosque in the Venetian Harbor is Kastelli Hill. At one time this was the location of the acropolis of ancient Kydonia, the Minoan Chania. It is well worth it to take a walk along the modern Kanevaro Street and take a look at the mansions. 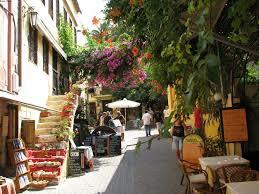 Behind the Municipal Market you’ll find Chania’s main shopping street Skridlof or Skrydlof Street. At the point where Skridlof meets up with Halidon Street is the area known as Stivanadika or “Bootmakers’ Shops”. Here you’ll find the traditional Cretan boots as well as leather goods and souvenirs. Traditional Cretan boots are known as “Stivania” and are the trademark of the Cretan male costume. These boots are tall, stiff, very durable and usually are black and sometimes but rarely white. 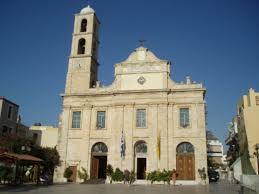 From here you can get to Chania Cathedral which is dedicated to Panagia Trimartyri or Virgin of the Three Martyrs, the patron saint of Chania. This cathedral celebrates its feast day on November 21, the Feast of the Presentation of the Virgin. The central aisle is dedicated to the Virgin, then north aisle to St. Nicholas and the south aisle to the Three Hierarchs. The cathedral was built during the Venetian period. Tourists enjoy exploring the Venetian Harbor area. Facing toward the sea to the right (east) of Eleftherios Venizelos Square is Kastelli Hill. You can also see the Turkish mosque and beyond that the shipyards where Venetians made repairs to their galleys. Toward the left is Firkas Fortress and the Maritime Museum. In the summertime people love to take romantic walks through the harbor and enjoy the view of the lighthouse and stop to have a meal at one of the restaurants and ouzo shops. When the night comes and there is a certain charm to the reflection of the lighthouse in the dark waters. There is a certain kind of magic to the Venetian Harbor. You’ll be invited to come into one of the tavernas. Since the waves have a way of washing over the quay in the wintertime many of the tavernas are shut. However on the side past the Turkish mosque the cafes and restaurants are untouched by the waves and remain open throughout the year. Even in the winter when the sun is out literally hundreds of people come here for the peace and quiet found at the harbor.